Pardew dissociates himself from club over Sochaux's UEFA complaint. | NUFC Blog. 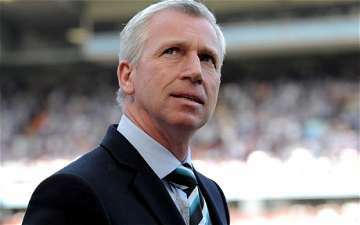 Pardew dissociates himself from club over Sochaux’s UEFA complaint. Pardew: Nothing to do with me Guv! Speaking in a rare interview, Newcastle United manager, Alan Pardew, has sought to dissociate himself from the club in the current controversy surrounding the attempted signing of Sochaux’s 23 year old striker, Modibo Maiga. Sochaux have threatened Newcastle United with a complaint to UEFA, something which comes hot on the heels of Charlton’s complaint to the FA over Pardew allegedly making allegedly innappriate comments on BBC Radio Newcastle about an attempt to sign Chalton’s goalkeeper, Rob Elliot. Newcastle have been much reported to be in hot pursuit of the player, despite his current club issuing a statement that he will not be released. “I can’t tell you anything about that. My brief is to highlight players I think would take the club forward, and the club’s job is to get it over the line. Meanwhile the search for a striker and a left back goes on (and on), as the club plays brinkmanship with other clubs who value their players at a much higher amount than Newcastle are willing to pay, and the complaints to football’s governing bodies mount up. – I wonder if that will work? doesn’t matter if alan dissociates himself from this,the poor b*****d will be the one who suffers,if the donughts running the club,end up on the receiving end of a transfer embargo.